When it comes to food, bigger isn’t always better but sometimes it’s pretty damn good. That seems to be the thinking behind the latest creation from the New York diner Bubby’s. The comfort food spot just debuted the Kitchen Sink, an ice cream sundae with 16 scoops of whatever flavor you want, as well as pecans, pretzels, peanuts, chocolate chip cookie crumbs, chocolate and caramel syrup, rainbow sprinkles, whipped cream and cherries. 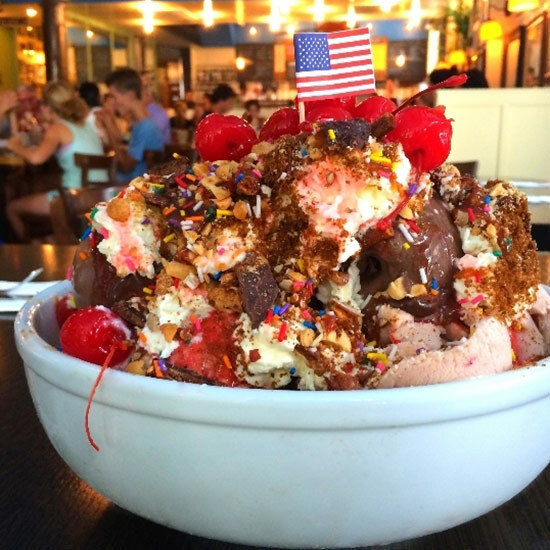 Oh, it also comes with an American flag on top because a giant bowl of loaded ice cream in the summer is about as patriotic as you can get. At $100, the Kitchen Sink isn’t the most expensive sundae on the market. That title goes to the $60,000 offering from California’s Three Twins, which will give you ice cream made with receding glacier ice on top of Mount Kilimanjaro.